Should you learn the pronunciation of radicals? When learning Chinese as an independent student, you constantly need to ask yourself three questions: what to learn, how to learn it and how much time you should spend on that particular thing. The first of these questions is in a sense the most important one; you don’t want to miss important things and you don’t want to waste time learning things that aren’t important. For example, should you learn the pronunciation of radicals? I see this question often, usually right after people have realised or been told that they should break characters down and learn the building blocks. The answer depends on what you mean. Strictly speaking, the answer is “no”, but if you’re a beginner asking the question and you haven’t got your terminology right, the answer might be “yes”. Let’s get the terms straight. A radical is a character component that is used to index that character in dictionaries. Each character has one and only one radical. There are different lists of radicals used in different time periods, regions and for different purposes. The character components on these lists are used as radicals, but it should be clear by now that they are not necessarily the radical in any character they appear in. In the first case, 知, the radical is 口 “mouth; opening”, in the second case, 扣, the radical is 扌, a variant form of 手 “hand”. 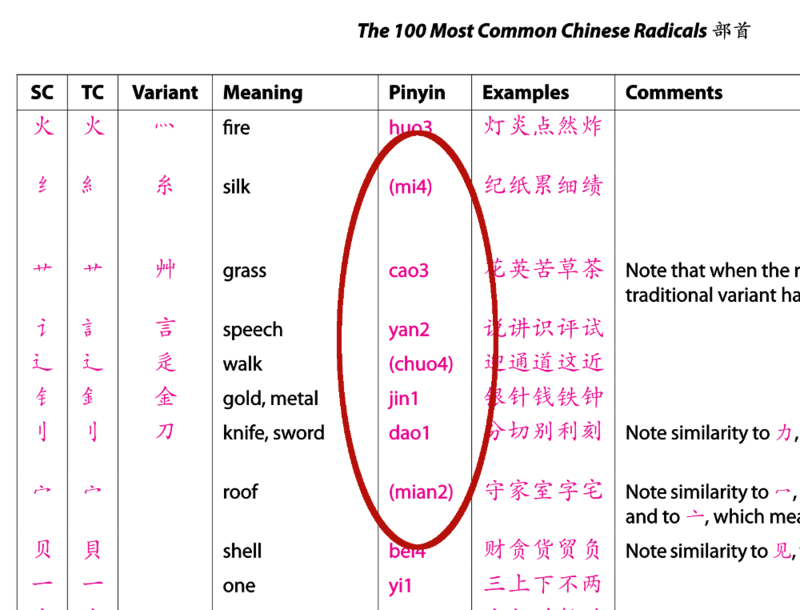 As you can see, 口 is (often) used as a radical, but not in all characters it appears in. As I said, radicals are for indexing, not understanding characters. Should you learn radicals in the first place? Why do people talk so much about radicals? If it’s from a second language perspective, it’s mostly because they are mistaken about what radicals are or they have given up and just use the term anyway since most learners will look for that (I’m guilty of this myself). Learning common radicals is useful, not because they are radicals, but because they also happen to be common semantic (meaning) components. Learning which component is the radical in a specific character is useless in a modern setting, but learning about the function of each component is very useful. The problem with most lists of radicals is that they aren’t suitable for language learners. They are often sorted by number of strokes and include radicals that are extremely rare and pointless to learn. To fix this problem, I have created a list of 100 common radicals that you actually should learn. It looks like this and you can get it as a PDF, text or Anki file here. I hope it’s clear by now what the difference between a radical and a character component is. Let’ move on! Now it’s time to have a look at the original question: Should you learn the pronunciation of radicals? If you really meant radicals, the answer is in general “no”. Many of the radicals have very strange pronunciations that even native speakers don’t know. Please note that these are the most commonly used radicals. If you look at a complete list sorted by number of strokes, a much larger amount will be useless in terms of how they are pronounced. However, if you actually meant “character components” when you asked the question about pronunciation, the answer is that it depends. 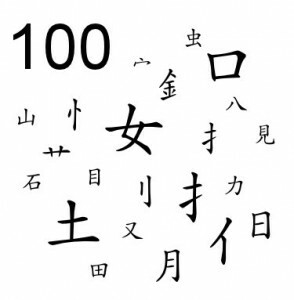 More than 80% of all Chinese characters are made up of a semantic (meaning) component and a phonetic (sound) component. Learning the pronunciation of common sound components is extremely important! If the component in question is not a common phonetic component, you should only learn it if it also works as a separate character as described above. I said above that most native speakers don’t really know how to pronounce many of the radicals. Try asking Chinese people how to pronounce 辶, 宀 or 彳 and you’ll see what I mean. You are very likely to be told their colloquial names, not how these characters are pronounced individually. Learning these colloquial names is very useful if you talk about handwriting with native speakers a lot, such as if you want to ask someone how to write a character verbally. For beginners, this is overkill, but for intermediate and advanced learners who care about characters, you should learn the most common ones. Don’t learn the pronunciation of the radicals unless they are also common characters in their own right (in which case you will encounter them as such anyway). Here’s a rule of thumb: if the pronunciation of the whole character is completely different from the character component you’re looking at, you can skip learning its pronunciation. You probably still want to learn what it means, of course, since this is the foundation of meaningful character learning in general, but unless in is a sound component, you don’t need to learn how it’s pronounced! Thank you for this Olle. Do you have any references on how to explain a character as a Chinese person would do it, using 走之旁 etc? It’s partly improvised using parts people know for sure and making sure the other person thinks of the right character. So for example, if you want to describe 这, you could say something like: 走之旁加文化的文. Not sure if that was what you were after? There are no fixed ways of doing this, as long as the other person understands what you’re talking about, it’s okay. More or less. But I wondered if there might be a web site that gave a more complete list of terms such as 宝盖头 that I would otherwise not come across. Currently, when I try to remember a character I use my own English concepts, such as “roof like thing with tick on the top”. 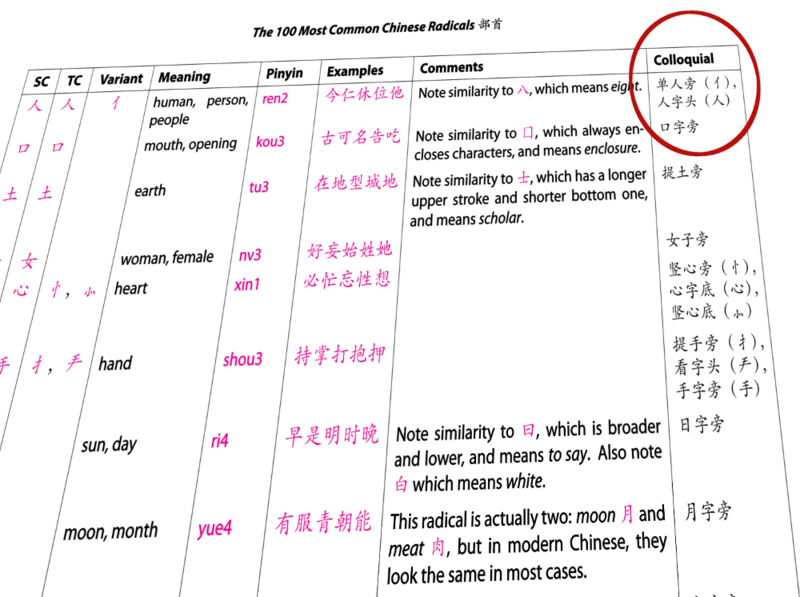 I thought it might be better to start using the typical Chinese way of describing the same thing. You have a hundred of them in my kickstart list linked to in the article! This was partly based on a longer list for all radicals, but it seems to be unavailable now. If you find anything more complete, please let me know! Isn’t the *entire point* of radicals deprecated? They were invented as section headings to enable lookup of characters in paper dictionaries. Certain character parts were arbitrarily selected as “radicals”. Now that everyone uses computer dictionaries, the reason for radicals has passed and we can all concentrate on components instead. Learning common radicals is useful, not because they are radicals, but because they also happen to be common semantic (meaning) components. However, since students sill ask about radicals, I write about it. THe alternative would be that the same students find resources about radicals that are not at all adjusted for second language learners, which would be much worse. I am considering making a list of phonetic components for my advanced students to study on Skritter. Do you A) know if there are any such lists already created on Skritter or B) think that would be a good use of time for advanced learners? I notice that after the summer, students have forgotten how to recognize and write many characters, so I’m trying to find some intelligent ways to help them. Thanks for any insights you have. I wonder, what the sense of the pronunciation of a non character radical is. It’s like asking for the pronunciation of an i-dot. In your top 100 radical list I miss the information whether it is an own character or not. This is indicated in the list already, as specified in the article, both in picture and text. The pronunciation written in parentheses can be safely ignored, meaning that they are either never or very rarely used as single characters.